With their gleaming blue and silver stripes, mackerel are a lovely fish. They’re cheap, tasty and packed full of healthy omega-3 oils. They can carry strong flavours and their oiliness means they can take a brief blast under the grill or on the barbecue without drying out. They’re a gift to the cook. Although they are fabulous whacked straight on the barbecue, preferably on a beach when you’ve just caught them, they can also benefit from a few more minutes prep and a quick marinade. Cooked this way with South Asian spices they are really good. 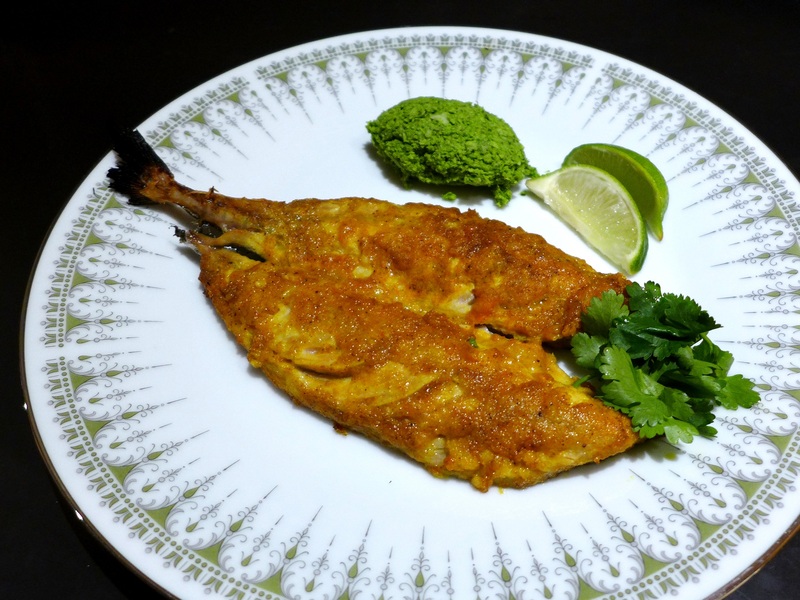 Please try the coconut chutney, adapted from a recipe in Camellia Panjabi’s 50 Great Curries of India, it goes so well with the spicy mackerel. Add a few chapatis and you’re sorted. 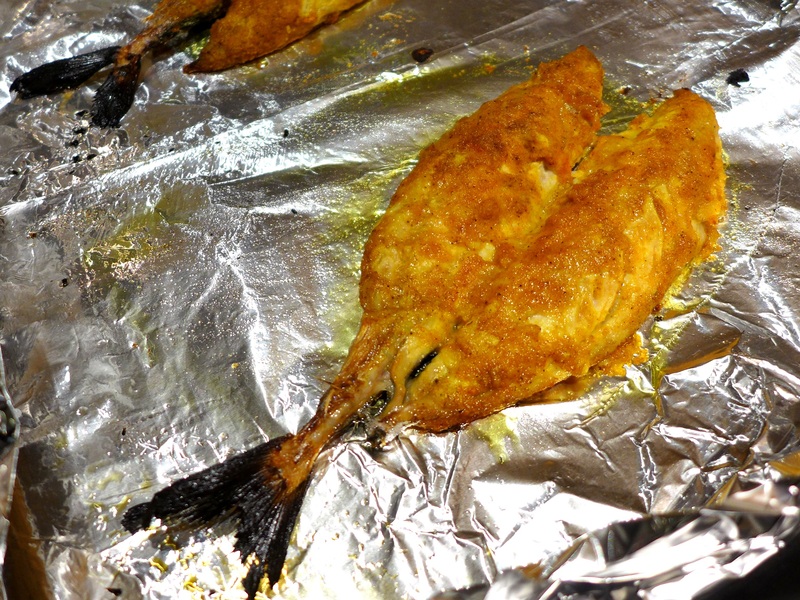 I used a pair of butterflied mackerel (ask your fishmonger) but fillets would work too. Just make sure they’re properly pin-boned. Make the coconut chutney first: put the dessicated coconut in a bowl, cover with boiling water and set aside for an hour. Drain well, then put in a food processor with the remaining chutney ingredients and process to a smooth paste. Scoop into a bowl and set aside. 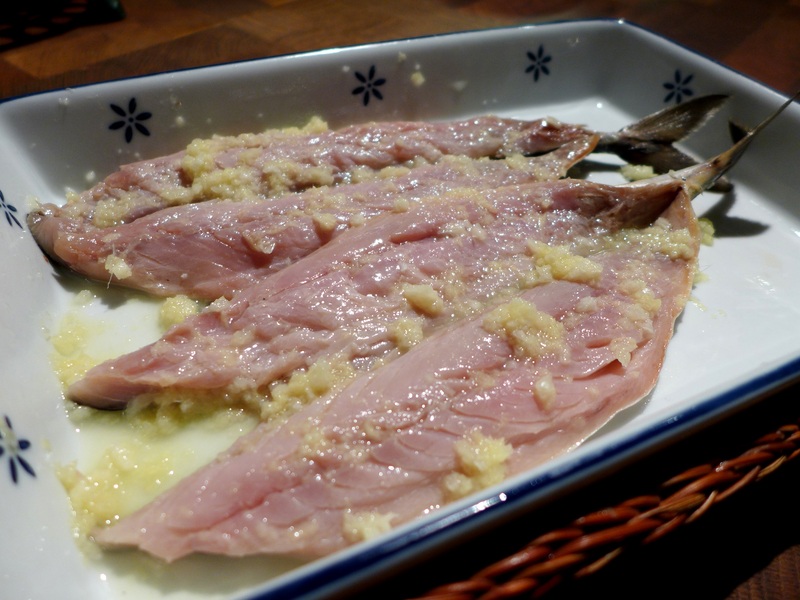 Mix the lemon juice with the crushed garlic and chilli and slather it on the mackerel. Cover and set aside for 10-15 minutes. Pre-heat the grill to high and line the grill pan with foil, oiling it lightly. Mix the flour with the remaining coating ingredients and spread it out on a large plate. 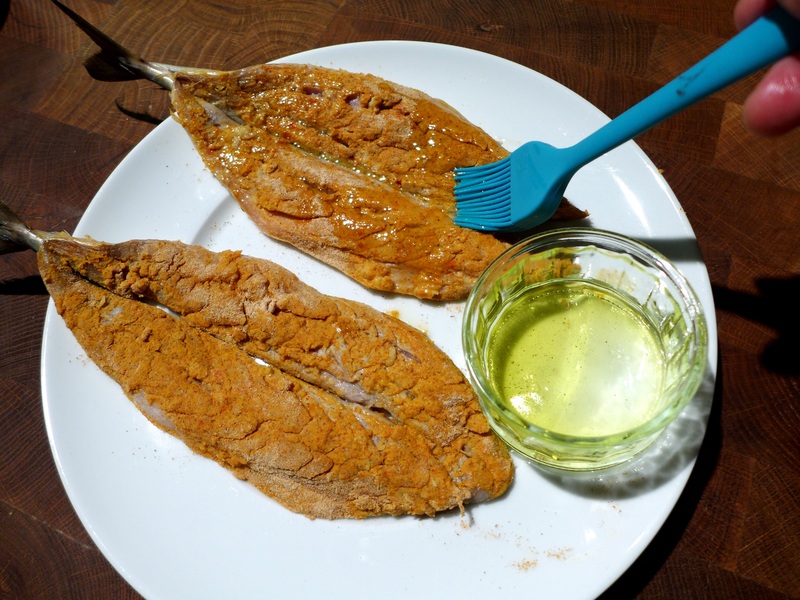 Brush the wet marinade ingredients off the fish – you don’t have to be too fussy about this – then dunk the mackerel in the coating, covering both sides. Brush both sides of the fish with a little oil and place under the hot grill. Cook for eight minutes, turning halfway. It should be burnished on top but still beautifully moist. Serve straight away, with scoops of the coriander chutney, lime wedges and warmed flatbreads. This entry was posted in Fish and shellfish, Mains and tagged coconut and lime chutney, masala fish, masala mackerel with coconut chutney by Linda Duffin. Bookmark the permalink. I may have to pass on the beach barbie – a bit impractical here – but this sounds a great recipe to be tried soon. Thanks, Margaret. Hope you enjoy it! They look delicious Linda. I love mackerel fresh. The only way. This sounds lovely. 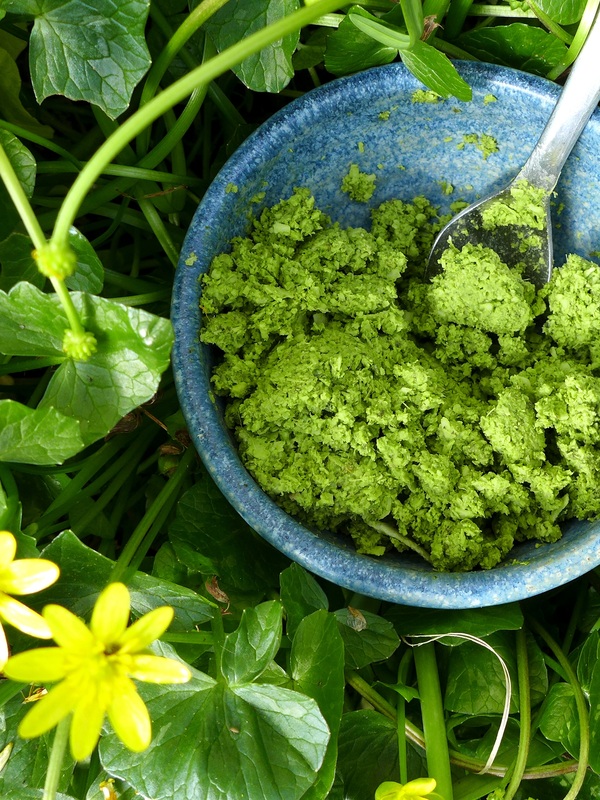 Mint, coriander and coconut is such a great combination. I don’t cook mackerel often although do have some fillets in the freezer. Apparently rhubarb is a good match too – who knew?! Thanks! Yes, I ate a griddled mackerel starter the other day where some barely cooked rhubarb was served like a vegetable – delicious.